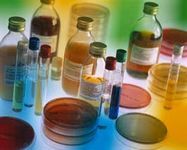 Pharmaceutical culture media are available for the control of nonsterile products. The products from bioMérieux allow the detection and enumeration of specific organisms and total viable counts according to the requirements of the European and US Pharmacopoeias. bioMérieux selects, controls and blends all raw materials to ensure full traceability from raw material to final product and to maintain the reproducibility of performances between batches.